At American Mobile Glass Service LLC our biggest specialty is the repair and replacement of vehicle windshields. We keep 500 windshields in stock at all time and guarantee either same day or next day mobile service. All customers receive free estimates and our work is covered by a lifetime warranty. At American Mobile Glass Service LLC we are in great standing with all the insurance companies. We carry out repairs from Knoxville, Tennessee to Frankfort, Kentucky, and all we need is the policy and VIN number – the number under the windshield. Once we have that we contact the insurance company and schedule repairs once all details are cleared. Rock chip repair on a vehicle windshield is essential if it is in the driver’s line of vision. For the customer’s convenience we will always bill the insurance company directly, verify the coverage, and then come to your home or office and carry out the repair. American Mobile Glass Service LLC has been in business since 2003 and now has two locations, one at Corbin, Kentucky, and the other in the city of Lexington, 90 miles away. The company specializes in repairing and replacing automotive glass. It is run by a veteran who was helped back into the workplace by veterans’ administrators after leaving the US Army. Mobile technicians are always happy to travel to carry out work on your vehicles at your home or place of business within a wide radius of our locations. When we say we provide a glass service we really mean it. We will fix all the glass windows on any vehicle, from private cars to RVs, classic cars, construction vehicles, trucks and semis. The vast majority of the work we do is carried out the same day or the day after you call us. We offer all customers free estimates and our workmanship is covered by a lifetime warranty. 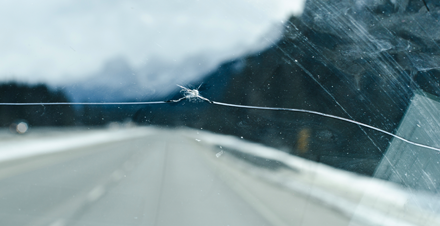 Rock chip damage is caused to a windshield by flying stone or road chip, and it must be repaired as quickly as possible. If you ignore the crack on your front window then it will only get worse and you risk damaging the entire windshield and needing a replacement fitted. In some states in the US it is illegal to drive with a damaged shield. When your vehicle suffers rick chip damage contact the experts at American Mobile Glass Service LLC and we will be with you within a day to get the problem sorted. At American Mobile Glass Service LLC we provide only the highest quality auto glass and windshield replacements. Wherever you are and whenever you need a replacement fitted, we will be there to help you. In the majority of cases we will travel to be with you within a day of you calling us. We keep a stock of at least 500 windshields at all ties, the most of any glass replacement company in Kentucky. ©2017 American Mobile Glass Service LLC. All rights reserved.